Dr Jones received mediation training from the Hon. Bruce Wayne Wettman and the Hon. John Coselli at the University of Houston Law School, Dispute Resolution Center. He has completed training as provided for in the Alternative Dispute Resolution Procedures Act. He is a qualified, neutral, facilitator. His mediation training, integrated with over 30 years of working with couples and families, brings an experienced skill set to help parties in dispute find a resolution. 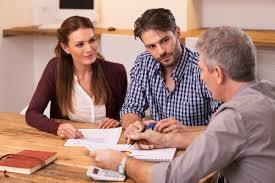 Mediation is a process by which an impartial person, a Mediator, facilitates communication between parties in a dispute to assist them in developing a resolution. By helping the parties to clarify their communication and their framing of the problem, the mediator helps the parties find a mutually acceptable solution. Mediation is flexible. 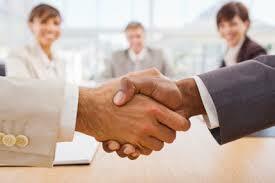 Unlike court, there are no hard and fast rules of procedure for the mediation process. The flexibility of the mediation process allows the mediator and the parties to find the most effective and efficient method to resolve the conflict. The mediation process focuses on the future and what can be done to preserve the long-term relationship. Participants are urged to focus on a solution that looks to the future. The mediator is not a decision-maker. The mediator is a neutral party who will assist individuals in deciding what the issues are, exploring possible solutions, and deciding which solutions work best. The mediator will ask questions to assist both parties in exploring the situation in detail. The solution to the dispute is determined by the parties, not the mediators. The parties role is to make a good faith effort to engage in the process, identify issues, explore solutions, and decide together what solutions work best. Win-Win Outcomes Predictability of Outcomes Personal Empowerment Workable Solutions Customized Solutions. Avoids the Costs, Times, Stress, and unpredictability associated with going to court. 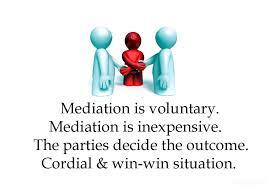 Mediation is usually scheduled in either half day (4 hours) or full day (8 hour) sessions. Fees are based on $175 per hour and shared by the parties. Fees are due for amount of time reserved, whether or not the full amount of time is used to arrive at an agreement. Additional hours beyond the time reserved may be used, although availability is not guaranteed.